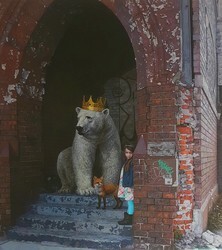 Hyperrealistic painter Kevin Peterson paints fairytale interactions of children and animals into unlikely situations. The young girls featured in each painting display bravery, coupled with a sense of innocence whilst they explore the streets of distressed cities and urban decay with their powerful companions. Graffiti marked spaces offer a contradiction that heightens the subjects dislocation but suggests subtlety the strength and triumph of the individual.